Midi Controllers have become increasingly popular to help expedite the workflow of music producers. The ability to produce real-time response and a natural analog feel for the various features of a DAW provide ample motivation for purchasing a separate piece of hardware. The versatility of the 49 key configuration allows it to maintain a position as one of the more favored MIDI controller configurations. However, the number of arrangements and brands of MIDI controllers make selecting one a daunting task. That is why we have put together a comprehensive buyer’s guide, so you know what the various features mean and which are more important for what task. Then we provide a list of the best 49 key MIDI controller to help get your search underway. More than anything else, the modern MIDI controller’s software integration is arguably the most important factor. That is not to suggest other factors are irrelevant, but without an internal databank, a MIDI controller relies on the DAW more than many other pieces of music production hardware. However, a MIDI controller’s software integration includes more than simply being able to work with a given DAW–though that is definitely a vital aspect. The way the MIDI controller maps its controls, encodes those controls, and even updates its drivers can all influence whether it will offer an easy experience or a frustrating one. Some MIDI controllers are almost designed to be used with a specific DAW–and a few outright are designed to be used with a given DAW, often including it as a bundle with the MIDI controller itself. However, that does not mean that you are simply stuck with using the DAW offered. The best MIDI controllers are compatible with most professional DAWs on the market, and some might even offer incredible flexibility for indie DAWs or lesser used models. Just keep in mind, if a MIDI controller comes with a DAW package, it will likely work best with that DAW and may present issues when using a different DAW. Most MIDI controllers come with the files necessary to automatically map the functions and keys directly onto your DAW. However, the quality and intuitive sense of that map can range from effortless to thoughtless, ultimately making using the MIDI controller a pleasure or a pain. To make matters more complicated, different MIDI controllers may map differently from one DAW to the next. While it can be difficult to determine ahead of time whether or not the MIDI controller will map its functions to the DAW in a way that works best for you, the inclusion of multiple DAW mapping configurations can at least provide a sense of comfort that one option is likely to satisfy. As difficult as it may be to figure out whether or not the MIDI controller will properly map its functions onto your preferred DAW, it is infinitely more difficult–if not outright impossible–to know how those functions are encoded before testing them out. Basically, once the DAW and the MIDI controller are synchronized, how accurate are the actual analog controls on the MIDI controller when used to alter the mapped function of the DAW? Some MIDI controllers may offer an excellent map of the DAW’s functions, but their actual controls do a poor job of controlling them in as easy a manner which can lead to a host of frustrations–though not outright failures in most cases. The way the MIDI controller maps its controls encodes those controls and even updates its drivers can all influence whether it will offer an easy experience or a frustrating one. This quality of software integration actually has little to nothing to do with how the MIDI controller interacts with your DAW–for once. Instead, the drivers of your MIDI controller are what allow the controller to be recognized by the operating system of the device on which your DAW is housed. Basically, how well does your MIDI controller play with Windows, OS X, Linux, iOS, and any other operating system your device might use. While most people will only really need to worry about Windows or OS X, a MIDI controller that provides drivers with greater operating system flexibility also generally produces a better quality driver in the first place. Keep in mind, as operating systems update, you will want your MIDI controller’s drivers to update as well, depending on the changes made to the OS. This factor can either be all-important or completely irrelevant, depending on the user in question. People who are used to using a keyboard who have actual experience with an analog piano are likely to place a prime importance on the quality of a MIDI controller keybed. However, those without significant experience or who learned music development with a keyboard and mouse before ever touching a keybed are less likely to require the highest levels of quality–especially considering an adequately robust proficiency with the DAW can account for the tactile control of a top-quality keybed. The action of the keybed refers to how closely to an analog piano the keys of the MIDI controller feel when played. Generally, the closer to a true piano the keys feel, the more expensive the MIDI controller. In fact, there are even a few MIDI controllers that utilize various technologies to mimic as accurately as possible the feel of a true piano. However, those MIDI controllers are often some of the most expensive available. Whereas the professional versions can be multiple thousands of dollars, even the least expensive ones generally hover close to the $1000 mark. This is the lowest quality key action and is most likely to be found on the least expensive MIDI controllers. Though, it is actually becoming relatively infrequent that a manufacturer will both making a MIDI controller with this key action. In fact, there are far more MIDI controllers with at least semi-weighted keys or better–even at budget prices. Though, the synth keys will generally come with the least expensive products. Semi-Weighted – This is by far the most common type of key action in the MIDI controller market. However, just because this key action is the new standard does not mean that the products are of a poor quality–nor does it indicate they will fall within a lower budget. On the contrary, some of the most advanced and expensive MIDI controllers will still only provide a semi-weighted key action. In fairness, unless the user has developed a moderate degree of proficiency with pianist techniques, semi-weighted key actions are generally more than adequate to accomplish their tasks. Fully-Weighted – While not completely replicating the genuine feel of an analog piano, a fully-weighted key action comes exceedingly close. In this instance, the keys will utilize a spring or even a modified hammer design to replicate the feel of playing a piano. However, even within the fully-weighted key action market, not all keybeds are equal. The brand’s specific architecture of the key action can very drastically such that one key action feels nearly identical to a true piano while another key action feels responsive without actually emulating the action’s feel with precise accuracy. It is important to note that fully-weighted key actions that use hammers are generally more accurate representations for a real piano than those that use springs. This is the pinnacle of digital keybed actions. Not only do the keys use a hammer to provide a fully-weighted action, but the resistance of the hammer will be more or less depending on which octave the key sits on the keybed. Specifically, the key action for keys that play bass notes should feel heavier than the key action for keys that play treble notes. Of course, unless you demand an exact replica of a real piano’s key action, you likely will not be able to justify the significant cost of this type of key action. Moreover, graded hammer key actions are generally reserved for keybeds with a full 88 keys–the least common number of keys found on a MIDI controller. The velocity of the keys refers to how sensitive the key action is to the force applied to it. For a traditional piano, the strength of the stroke can produce a wide range of volumes and timbres. However, it does require a fair amount of proficiency to achieve the myriad results with any consistency. For MIDI controllers, this is one of the areas that quality and price can often match up more closely than with the other features. Budget MIDI controllers are more likely to have poorly scaled or accurate velocity registers–even if the MIDI controller boasts a wide range of velocity curves. The feel of a keybed refers explicitly to the tactile feel of the keys which is determined by its shape, weight, and material. This factor is arguably the least important when it comes to the keybed as it does not actually affect the player’s ability to control the sound. However, for certain music producers, a poor quality feel of the keys may cause a distraction which can affect their ability to play. Still, there are points where the key’s feel may produce legitimate concerns. For instance, within the key profile, or the shape of the key, a dipped profile is generally preferred as it provides a more durable key. On the other hand, a diving board profile can feel insubstantial and be more prone to break over time. However, the waterfall profile is often used as it allows the fingers to easily slide off the keys. Sliders can technically be used the same way as knobs–and even for the same functions depending on how you map them. The most common use is for faders, track volume control, EQ settings–though few experienced music producers have the same exact configuration as another. Still, for quality, the length, feel, and action of the slider all weigh into its quality. For instance, longer sliders offer a wider range of precision and refinement in terms of control. Moreover, motorized sliders will move the image on the DAW when shifted, but the DAW will actually move the analog slider when using a mouse. In terms of its function, arpeggiators are actually a VST or plugin that is applied by the DAW to the track. However, numerous MIDI controllers offer various arpeggiator controls to adjust the effect, chord structure, rhythm, etc without having to return to the mouse and keyboard to make tweaks. In this regard, the quality of the controls are generally less determined by the actual analog feel and more by the quality of the drivers in the MIDI controller itself. However, a quality arpeggiator on your MIDI controller can increase your workflow and make subtle adjustments on the fly not only a breeze, but a pleasure. Depending on the MIDI controller, the buttons can carry a whole host of effects. In fact, the basic buttons of a MIDI controller are often some of the most customized controls–excluding transport buttons. The need for quality buttons will likely hinge more on your experience level than anything else. For instance, assuming the button features a durable enough design to be pressed repeatedly without wearing down the activation, a non-slip or rubberized surface is about all that is required. However, some people may have different preferences on the size or texture of the buttons, but rarely does that end up being the deciding factor. Pedals can be a take it or leave it kind of control for a MIDI controller. For one, they are ultimately an analog port from a piano which often leaves non-pianists ignoring them altogether. Keep in mind, a MIDI controller pedal need not follow the dampening or sustaining effect of a piano pedal, but unless you are used to a pedal control in the first place, you are liable simply to stick with the board. In terms of quality, a MIDI controller pedal should feel somewhat robust. It does not need to actually be heavy, but since you will be pressing it with your foot–potentially while standing–you definitely want it to be able to handle far more pressure and force than the other controls. Easier mapping is also a bonus if you intend to customize its function. It is a little known secret in the music production industry that Novation has become a veritable king of value. The brand manages to accomplish this by providing some of the best features found on MIDI controllers for a fraction of the cost. This has led to the Novation Launchkey series in particular to become one of the more lauded MIDI controllers on the market today. First, the Novation comes with a fairly impressive touch pad at this price point. Aside from the fact that it provides 16 pads, they are also lighted with a wider RGB range than most MIDI controller touch pads. However, they are also somewhat small compared to competitors’ pads and arranged in a line rather than a square. Another issue with the touch pads that also seems to plague the keys is a hit-or-miss velocity. Basically, you will have to slam the keys to get a loud sound and a soft volume is just as difficult to triangulate. Moreover, the keys use a synth action and feel flimsy–a trend that seems to permeate the product as a whole. Unless you are looking to shell out some serious cash, the Akai MPK 249 is arguably one of the best all around performing MIDI controllers out there. Keep in mind, the Novation may provide a bit more value, but that is in a large part due to the fact that it is also almost half the price. Still, the Akai offers some of the best features out of any product on our list. First, this MIDI controller provides one of the better keybeds reviewed. The keys themselves are full-sized and feel sturdy enough. Moreover, they are semi-weighted and feature a solid velocity curve that is comparable to competitors costing hundreds more. On top of that, the DAW integration and litany of possible control configuration will make your head spin. However, all of those control features can come at somewhat of a cost. Specifically, if you are looking to custom map the controls–and with this many controls why would you not–then you are going to have spend a considerable amount of time with them. Unfortunately, that time can occasionally be for not as the recording function may not register the changes due to finicky encoders. Alesis is a brand that is trying to compete with Akai and Audio M but just cannot seem to get everything right to mount legitimate competition. Specifically, it seems like they divvy up the various features over different products such that if in a single package, the Alesis would be one of the best MIDI controllers available. As it stands, it always feels like a missed opportunity. For instance, the VI 49 comes in two different configurations, each boasting their own advantages and disadvantages, However, both products suffer from a complete absence of sliders which is one of the more standard type of controls found on pretty much every reputable MIDI controller. However, the version we decided to focus on makes use of an impressive 4.3” full color high-resolution display screen. This screen blows even the Akai out of the water and features numerous display formats to keep track of all of your current DAW settings. Unfortunately, changing many of those settings will be a pain since you have to scroll through many of the control options rather than change them with a single analog. 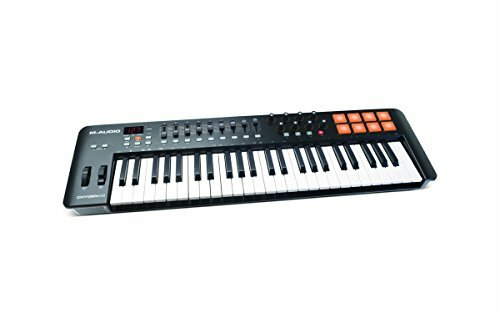 M-Audio offered an impressive MIDI controller to compete with the Akai 249 when they released their Axiom model. The Code lineup has taken up that reign as M-Audio now attempts to enter the more budget-friendly market with the Oxygen series. Unfortunately, the Oxygen series present as a bit underwhelming. For one, the keys use a synth action that is not especially responsive–either in terms of the feel nor velocity. Moreover, this is not truly a MIDI controller as it does not feature a MIDI output, making it entirely reliant on a computer or smart device–and even the smart devices are limited to Apple products, though that is not unusual. Still, if you are a producer that regularly travels to outside studios or even performs live, then you will surely appreciate the Oxygen’s portability. In fact, this is both the smallest and lightest MIDI controller we reviewed and is significantly lighter than most of its competitors. It also features solid DAW mapping with DirectLink, but you will need to download the appropriate DAW drivers from M-Audio’s website first. Our final MIDI controller is definitely designed with the consumer seeking the best price in mind. However, it should be expected that you will sacrifice some quality when you look for a deal, but the Nektar is actually surprisingly capable despite being the least expensive MIDI controller we reviewed. For one, less expensive MIDI controllers are often noted for being a bit finicky when it comes to auto-mapping the controls onto various DAWs. This is especially relevant if the user is employing an older version of the DAW or outdated computer hardware. Thankfully, the Nektar not only sets up easily with most arrangements, it is even fairly easy to customize the control mapping–something not found all that often. However, like a number of the lower priced MIDI controllers on our list, the Nektar provides these features at such a low cost by skimping on the keybed. In this case, pretty much everything about the keys is less than ideal. The synth action feels artificial which is only matched by the poor feel of the flimsy keys which themselves have dubious velocity recognition. Hopefully, our comprehensive buyer’s guide provides you with more than enough information to fully understand what makes a MIDI controller tick, what makes one feature better than another, and which features are most relevant depending on your level of experience. Keep in mind, the software components are arguably the most important–especially considering that the MIDI controller does actually produce sound nor generally include a voice bank. Moreover, the responsiveness of the various controls–whether they be keys, pads, knobs, or anything else–will heavily impact the ease and speed at which you can craft music. Finally, we feel confident that you can find a solid option for a 49 key MIDI controller within our list. 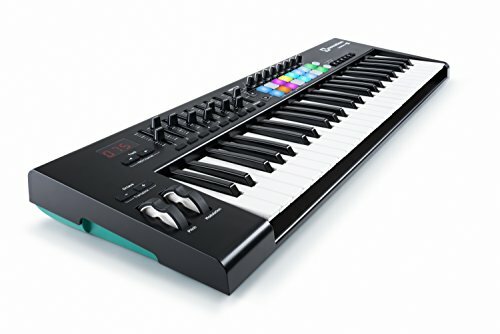 Whether you need a MIDI controller that can provide a full suite of custom options or are simply looking for a budget item that is plug-and-play, one of those entries could easily be the best 49 key MIDI controller for you. Still, if you are looking for the best all-around value, it is hard to argue with the Novation’s price and combination of features. 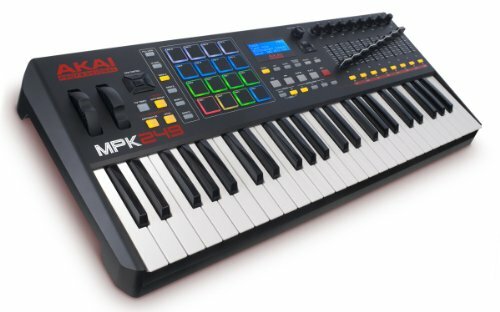 However, if you are simply looking for the best performing product, the Akai MPK 249 is a significant investment, but can grow with you to the highest levels of skill and experience.